A few days back I had made a post about Giant Wall Sockets. 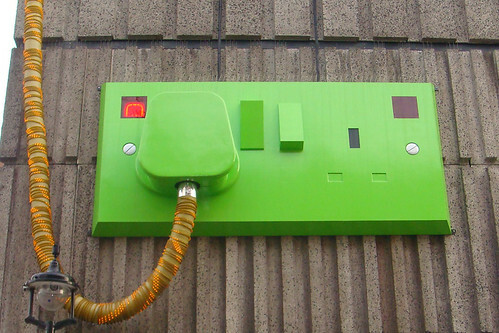 Today I present a huge Plug and Socket on a wall of building on Ganton Street at the Marshall Street intersection, Soho, London. It was installed around year 2000 alongwith large decorative bulbs. Later these were replaced with large vertical neon rainbow lights which glow in the night. 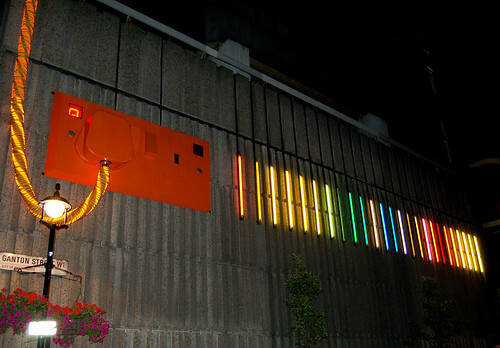 The colour of plug and socket is changed every year and it is also illuminated during the night. No further information is available about the building or this art work. As per some website the building houses an electric utility's office/sub-station. It is also the office of 'The National Magazine Company'. Image from Flickr is by Zemlinki!